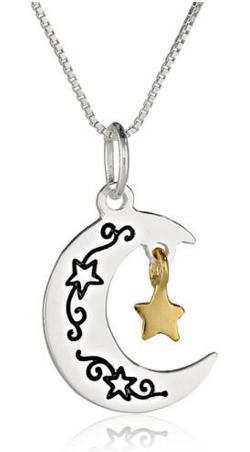 Two-Tone "I Love You To The Moon And Back" Moon And Star Pendant Necklace, 18" Just $15 Down From $65! You are here: Home / Great Deals / Amazon Deals / Two-Tone “I Love You To The Moon And Back” Moon And Star Pendant Necklace, 18″ Just $15 Down From $65! Two-Tone “I Love You To The Moon And Back” Moon And Star Pendant Necklace, 18″ Just $15 Down From $65! Here’s a nice Amazon deal. Two-Tone “I Love You To The Moon And Back” Moon And Star Pendant Necklace, 18″ is just $15 down from $65! Get yours now while it lasts!